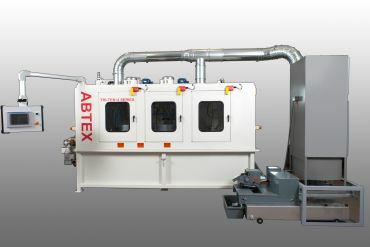 Abtex Corporation has expanded its line of Tri-Ten deburring systems to include a two-head, U-Series, high-productivity system. The second planetary head, operating in tandem with the first, provides extra brushing time to completely deburr the part without sacrificing conveyor speed. At one end of the system, parts are placed on a magnetic conveyor that carries them through the first offset planetary deburring head where three 10-inch Abtex fiber abrasive disc brushes deburr the upward facing surface. Parts then pass through a second, identical planetary head before being captured by a turn-over conveyor that flips the parts for the return trip through both planetary heads. After both sides of the parts are deburred, they are demagnetized, and pass under a rinse and air knife before exiting at an opening next to the entrance. The new system is equipped with mist collection system and a coolant filtration system. The filtration system includes a magnetic separator to capture fine metallic particles. A paper bed filter provides final filtration.